The collapse of Kilauea appears to be headed East – North East away from Jagger Museum and the Visitors Center. The energy seems to be headed towards Kilauea Iki and Volcano House. This image and all the others on this page are from the USGS Kilauea Photo & Video Chronology webpage. 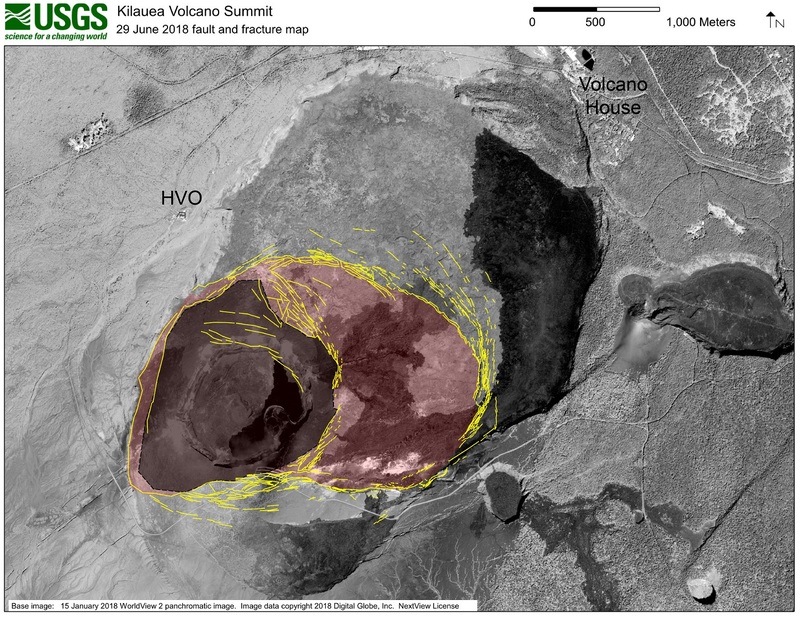 The slow collapse and widening of Halema’uma’u is terribly fascinating. This is a historical catastrophe unlike anything ever witnessed in modern time. The next few weeks should tell if the crater walls of Kilauea proper will contain the collapse. It appears to have done just that (mostly) on the South side. The park is already forever changed. I hope to visit in person in August. This entry was posted in Big Island, Kilauea and tagged Big Island, Kilauea on July 2, 2018 by mikeuslan.